In an effort for full disclosure (and to confirm that I am indeed, just like you!) I am going to share a personal story that I struggled with last week. Ooh. They are probably the one thing on those shelves I would have wanted, but I resisted. How awesome of me, right? 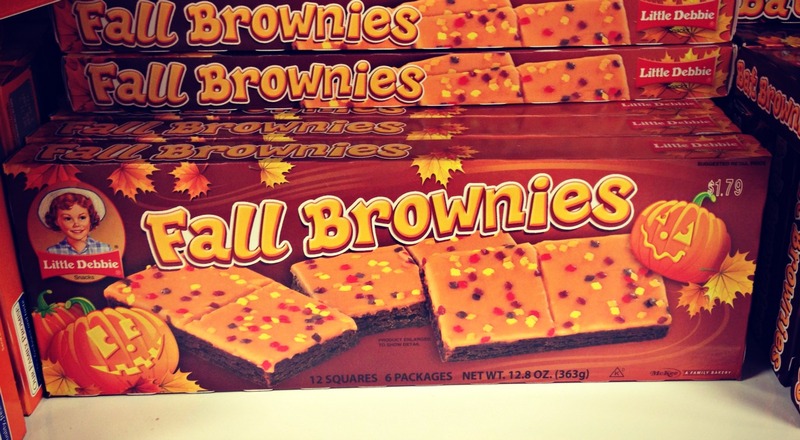 But beside my beloved fall brownies were boxes of these…. Playing the safe side, I chose them, after all, both my husband and son would enjoy this rare treat. Following my own rule of “don’t keep the enemy (and by enemy, I mean foods you shouldn’t have but could gorge on if allowed) in the house”, I threw them in the cart. I don’t even like Nutty Bars. So I get the Nutty Bars home. Not even tempted to open them and chow down. The next day, my kids wanted a snack, so I opened the package and gave them one bar each. I decided to take a bite out of one to try it out. After all, it’s just a bite and I don’t really like these. Oh wait. Maybe I do? So then I had to take a bite out of the other bar. It’s only fair, right? It went down so fast. Then one bar became two. So why do I tell you this? Well, it’s a learning experience for me and hopefully one for you. 1.) The flesh is rarely satisfied…especially with sugar. I thought that I could stop myself after one bar. I thought I could stop myself after one day. But I couldn’t. Willpower will only take you so far until you eventually break. Sugar is the biggest culprit for never leaving us satisfied! Each of us has to decide if taking that bite is worth it. Some of you have better self-control than others. It’s specific person to person. 2.) Don’t be surprised when something comes from outta left field and hits you. 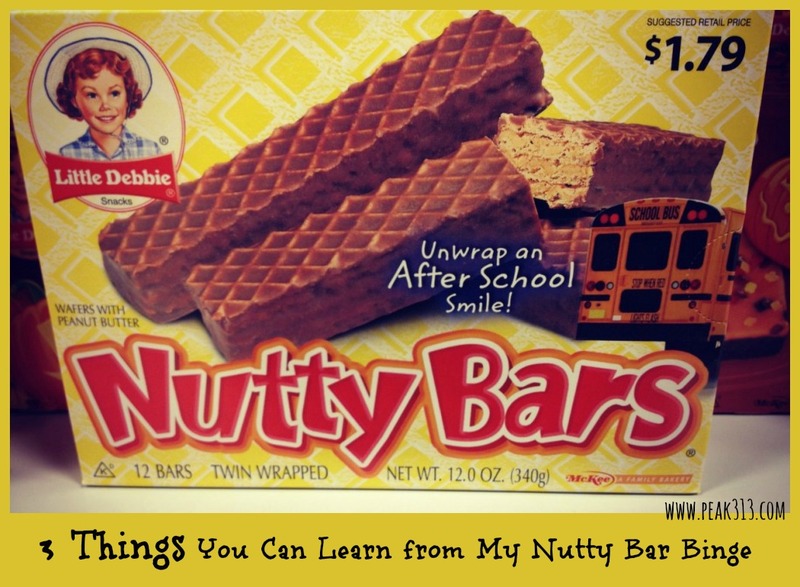 I intentionally bought the Nutty Bars because I thought I’d do well with them. I did choose them over my first love, right? It’s a good reminder that we should primarily fill our fridges with things that are good for us. When a moment of weakness hits, you may just reach for that one thing that you swore you’d never have. 3.) Eat like junk. Perform like junk. I am not gonna lie. My workouts those days were BLAH. I felt really tired and “heavy”. Which is totally disappointing because I like to kill it when I hit the gym. I’m sure part of the “blah” was the disappointment in myself. It’s one thing to do that one day, but it’s another to repeat it, for two days. We are rounding the corner to Halloween which means candy, candy and more candy. (especially if you have kids and even if you don’t buy it for them!) It’s a good time for us to evaluate our plan of attack. ~ Should we indulge at all? ~ Are there foods worth cheating for? ~ What’s our plan to get us back on when we get off track? Finally, I’d like to make the connection with junk and our flesh with our spiritual lives. Is there any junk that you intake spiritually that is leaving you with the same after effects as the physical junk? Is there anything that might fly out of left field that could knock you down? Are you noticing that your “spiritual performance” is a bit sluggish and “blah”? If so, then think through some of the things you are consuming. I think you must b a fly on my wall./.. This post is so much ME! Thank you for being real, and just putting it out there.. I can’t keep the temptation of sugar in my house, and I fail 100% of the time when I bake.. It is so reassuring to know that I am not alone in this struggle..
Nope, no Nutty bars for me, but the candy corn, well that’s a whole different ball game!! I had a rough week last week with some food choices as well. Two big splurges. Thank you so much for being transparent with us. This is also a reminder that this battle for our health is ongoing and will never end. It was candy corn for me last week. I ate half the bag and had the worst headache ever for 2 days! Sitting here with a bag of candy corn as I read this! Mini hostess donuts… One day after a long run I stopped in the grocery store to pick up some eggs and milk. I walked passed the donuts and caught a wiff of them. I broke down and ended up eating almost the whole bag. I was so disgusted with myself and felt terrible that night and the following day. That was last year and thankfully I haven’t done anything like that since! I love nutty bars. I usually have to leave them at the store or else I will eat them all. I was weak this week and bought a pack. I am fighting with every bit of will I have to not eat them all. Thank you for being real! And showing us we are not alone. Tootsie Rolls! I just bought a bag and I want to open it soooo bad – but I am not going to open it until tomorrow night for Youth Group (I bought them for my youth group kids!)! Please Lord – help me fight my flesh! lol, been there, done that. thanks for being real. I’m glad you’re normal! 🙂 It’s so easy for us to think, oh, she’s the one who leads the fitness blog, so she must do everything just right! 🙂 So glad we don’t have all the Halloween candy here (although I must say that I do occasionally miss candy corn!). It’s nice to know that someone so healthy and on top of their game is down to earth and can have the same pitfalls that I do! It’s also nice that the world didn’t end and one can pick themselves up and get back at it! I think it is wonderful & mature that you decided to be so transparent. Thank you Clare! I do not cave to Little Debbie snacks but I do to dark chocolate! I so know what you are talking about!! Thanks for sharing your “human” moments. I know that one taste of my favorite cake, cookies, or brownies can send me into a downward spiral and hold me there. Since eating clean(er) these past weeks I’ve noticed a huge change in my cravings as well as keeping my body properly fueled to avoid a binge. It will always be a struggle but right now, I feel armed. I love the connection between eating junk and the flesh and our spiritual lives. So true. BUT, I wouldn’t call eating 2 nutty bars a day, 3 days in a row a binge, LOL! I wish my binges were like that 🙂 Definitely something I’m praying about because I’ve struggled with that lately and I know it’s a sin. I’m impulsively turning to that food instead of God when I’m stressed, anxious or overwhelmed. I love your blog, I wish I would have found it in time to get in on the challenge. Will you be doing another one any time soon? Wow, no offense but a pack (2 bars in 1 pack) is hardly a “binge”. Even 3 days in a row. Now a box a day for 3 days is a binge. I know you didn’t intend to make anyone feel worse, but saying you felt “heavy” from a single pack of Nutty bars per day makes you sound perfect. Like “I’m so perfect in my eating that even the tiniest bit of ill nutrition makes me “heavy”. I have a REAL and very SERIOUS problem with sugar. Like one of those people who could eat 1/2 a pan of brownies in 1 day. I guess that’s why I see this blog as being so far away from my own reality that I may need to find a new one to read. I don’t want to be encouraged to eat sweets but I also would prefer to here from someone more attune with how crazy the SAD is & encourage folks to leave that behind for the most part. But not be perfect eaters who can’t even eat a Nutty Bar w/out seeming like it’s a crime. I’m sure many will attack me for my post, but I just felt the “binge” description may have seemed unrealistic to some readers. Hi there! We are all at different places in life and I can only speak to what I’m experiencing. I will always be truthful and pray that God will minister to those who need it! Well that’s actually encouraging that you at one time had similar brownie issues…I didn’t mean to come across mean. I just felt very discouraged b/c I feel I am literally addicted to sugar & dairy. There are countless eating plans that who knows which one is right for a sugar/dairyaholic…the worst part is sugar & dairy literally make me nauseous & I still end up eating them. As far as addiction to sugar and dairy..have you considered researching the Paleo Diet. (When I say diet, I don’t mean a short-term…it is actually a way of eating that many have found success with) It really limits or avoids sugar and dairy and many people have found great success with it. My diet is based off of this with a few changes. It’s something I’ve just learned about over this past year. Thanks for coming clean, Clare! I recently bought SIX bags of Halloween candy. I intentionally got 2 bags of Milky Ways since I don’t particularly care for them. But, I have to admit, the bag of Twix and the bag of Snickers? GONE! I loved the way you related exercise to our spiritual relationship with Christ. 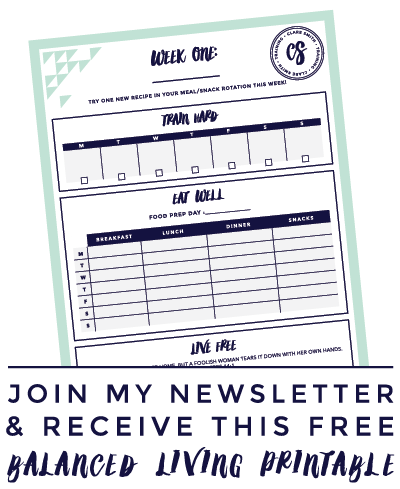 I totally agree that when I make poor eating (which has been too frequent lately), I don’t feel as energized before, during, or after a workout. I admit the same can be true in my spiritual life. Thanks for the reality check. Twizzlers are my nemesis. Specifically Twizzler Cherry Bites. Seriously. They are NOT allowed in the house. I’ve actually eaten them until I got sick before. Terrible. I’m pretty good in all other areas of food for will power. Twizzlers=Kryptonite. I am a rare sweet eater, but it seems that living now in a house where my future mother-in-law buys sweets ALL THE TIME (like pumpkin donuts, double stuff Oreos), it’s so hard to not give in and eat them all up when I see them. If they’re not there, don’t crave them at all. If I see them, I won’t hesitate to eat the package. It’s good to know someone else struggles with the same thing, even if it’s just one or two bars (because that’s still a downfall, regardless of amount). ooooh Nutty Bars (DANGEROUS) for me anyway. I LOVE them – I haven’t had one in years but reading your story brought back memories. lol AND yes I want one now and it’s all you’re fault (just kidding) – if they were here, I would eat them. I don’t buy anything that has “Little Debbie” on the box, just too much for me. Thank you for sharing!!! I know me … if I buy sweet treats, I am gonna eat sweet treats. There have been very few times where I have been able to endulge in a cookie or two and leave it at that. More often than not, it is eat until I feel every negative emotion catch up and envelope me, throw the rest of the treats away, promise myself I will never do that again and beat myself up for the rest of the day. Satan wants me to feel like I can never break this cycle, but I am not giving up. Thanks for reassuring us you're 'one of us' every so often, lol! I came across this sight by chance. 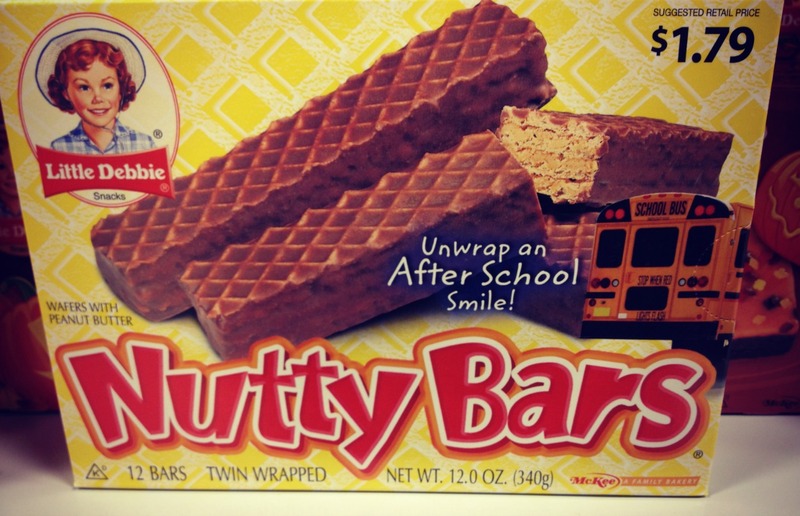 I eat really healthy 99% of the time, but I have one weakness: nutty bars! Every few weeks I’ll buy a 6-pack and typically eat them in a day or two. Gross, right? It’s the only junk food I EVER eat, so I thought I’d try a scare tactic and googled “dangers of nutty bars” and this came up 🙂 But anyway, wanted to say great article, and I’ll be following your other posts as well! I am a total sugar-holic and my will power is low. Couple that with a husband who is a stress sweets eater and I have many bad days. Nutty Buddy’s are my favorite Little Debbie treat and I do not buy them……but my sweet, adorable, loves me like I am husband brings them home on occassion along with sugar wafers, Keebler chocolate chip cookies, which I don’t like but will eat if they are close by. I’m sure I am full of inflammation from all the stuff we eat that we shouldn’t. I know I need to stay away from sweet treats because I would feel and look better, but it’s really difficult with a stressed out husband. Wow! So me this week! I had just left Planet Fitness, ran in Wal-Mart for some milk & there right there in the center aisle was MY weakness . . . Mega-stuffed Oreo’s! Usually, in the past, my self-control stopped me from buying Oreo’s, but not that day! Do you know there were 180 calories in just 2 of those little buggers??? I think you helped me with my self-control after that with your article with the triangle on Sweet Spot. One good result from my splurge was that I felt soooo guilty the rest of the week that on Friday morning my weight was actually down 3 lbs! It really does make a difference once you take a bite doesn’t it. I binged on Halloween candy a few weeks ago and then the day after Halloween I set mini goals all of Nov 1st to not eat any, and to my surprise I actually did it. Yesterday however was much harder as I thought I would allow myself a few pieces, because, you know, it’s a treat right? Well, one became two, two became, three, and three then became a pretty big dent in the chocolate bowl. Today it is back to zero tolerance for me. The sugar is absolutely addicting, it sets off things in your brain that you can’t control and then will power means nothing. I know I just need the power to avoid it in the first place.